It’s certainly been quite a week here in Michigan. Six straight snow days closing all of the area schools and many area businesses! I guess this is our punishment asking Mother Nature where winter had been. 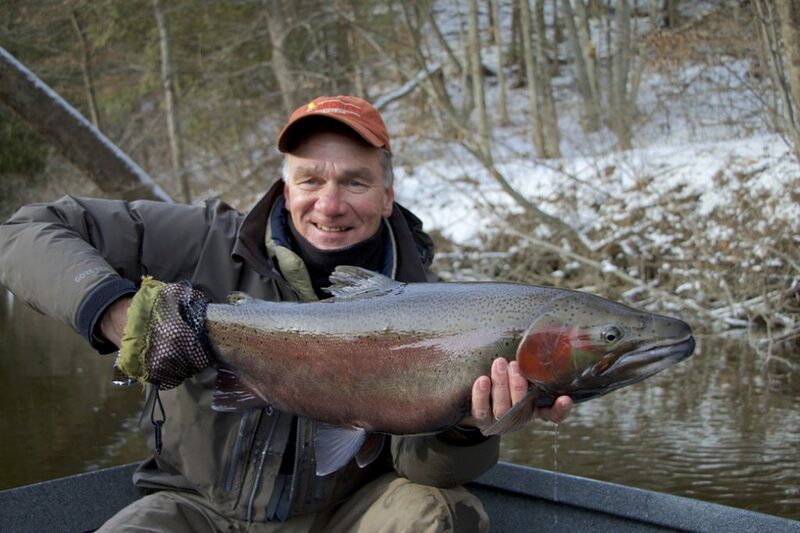 Winter continues to be the predominant feature during the month of February, but a noticeable increase in daylight will begin to usher spring steelhead into the Muskegon no matter how wintry the month is. Winter trout fishing continues to be productive as water temperatures have the trout schooled up in their favorite winter lies. Two-handed steelhead anglers will continue to hunt the soft water and slow woody runs for winter fish. Deep-water nymphing the deep gut of runs and pools will give way to new spring fish that have entered the system. No matter the style of fly fishing or species you seek during February you’ll continues to be treated to a winter solitude that is sure to please on the Muskegon River. Spring booking are coming along nicely. Single-day trips remain readily available while multi-day trips combined with the Muskegon River lodge are becoming more limited. Please consider making your plans soon so we can provide the services and dates you desire. Call us at 616.293.0501 or email fishon@riverquestcharters.com. RiverQuest Charters site or join our social media feeds.